The RAG Aktiengesellschaft (RAG), Herne/Germany, with its three active collieries of Prosper-Haniel, Auguste Victoria and Ibbenbüren, is currently in run-down mode. Auguste Victoria is set to close at the end of this year, while production is to cease at the two remaining collieries, Prosper-Haniel and Ibbenbüren, in 2018. The company will then enter the post-mining era and will have to shoulder the ‘eternity burden’ of coal industry-related operations such as mine dewatering. 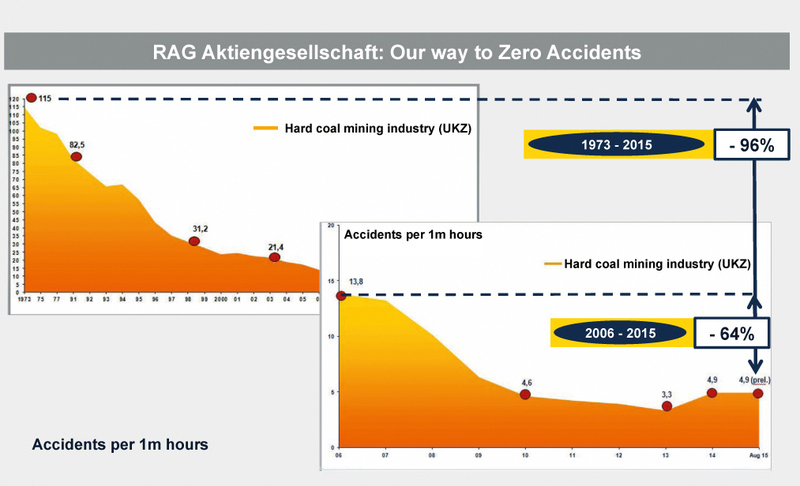 RAG has pioneered and implemented a whole range of operational safety developments at its collieries and with the end of coal production these achievements will to some extent become devoid of purpose, and may even be lost completely. This would be irresponsible, given that mining operations will be continuing in the wider world and that the company has built up a body of experience that should be kept available. The equipment and procedures that were developed at RAG collieries were not put into practice on a “nice to have” basis but rather were based on the results of actual events and industrial accidents, whose future prevention called for measures that were then incorporated into the company’s safety plan and safety regulations. This paper, which is based on a presentation given by the author to the International Mining Rescue Body Conference (IMRB) 2015 that was held in Hanover on 8th September 2015, traces the history of these developments and how they were introduced by RAG. Mine rescue brigades all over the world have to display qualities such as intelligence, even-handedness, courage and restraint in equal measure. Mine rescue teams are always there to be relied on and are always ready to carry out their missions under the most difficult conditions in order to protect and save lives. The Central Mines Rescue Station, which is a joint mining-industry body representing activities such as emergency rescue, self-rescue techniques and fire and explosion protection, was established in Germany more than 100 years ago. Since then its rescue teams have responded to all kinds of mining emergency situations and their actions have helped ensure mineworkers’ safety over the years. These rescue brigades are a key part of the current mine safety strategy. 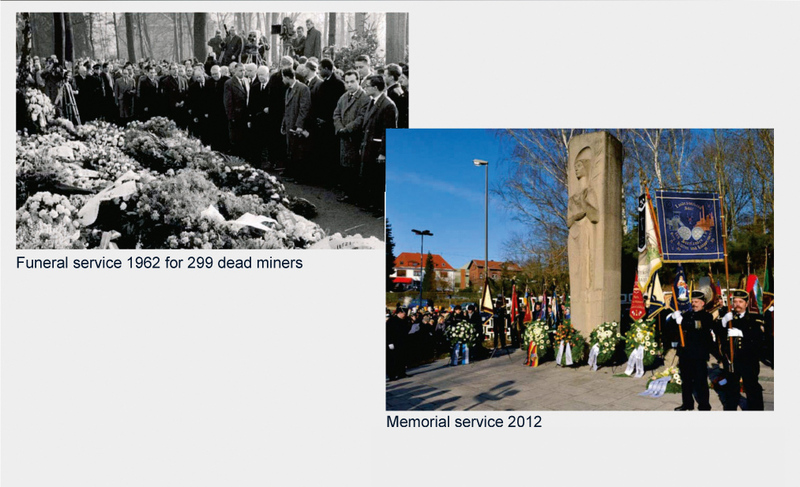 Two major incidents can be recalled that aroused international attention at the time and indeed still stir the emotions of the mining community to this day. On 9th November 1963 an exceptional rescue mission was carried out at the Lengede-Broistedt iron ore mine in which eleven miners were brought out alive thanks to the use of a special rescue capsule termed the ‘Dahlbusch Bomb’. This audacious feat, which thanks to a number of fortunate circumstances also became known as the ‘Lengede miracle’, was only made possible as a result of various mine safety and rescue developments and the support of the mine rescue service and other helpers and technical departments. This work commenced in 1955 at the Dahlbusch mine in Bochum. 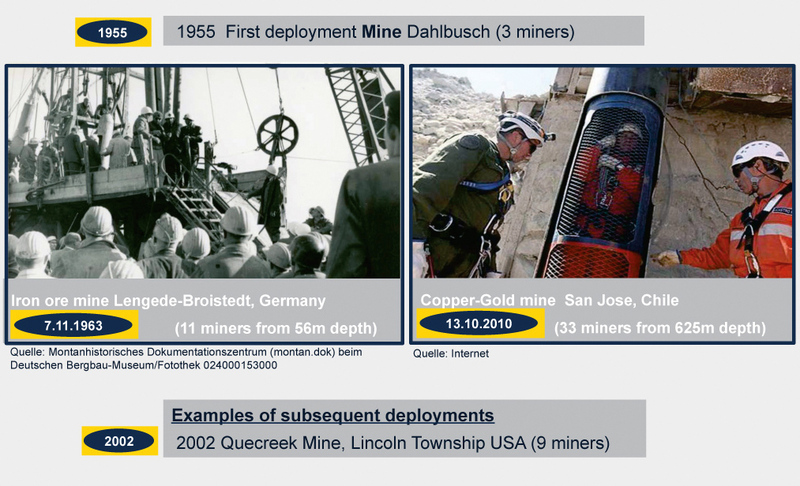 The same technology was also successfully deployed in November 2010 in the Atacama Desert in Chile, when 33 miners at the San Jose copper-gold mine were rescued alive from a depth of 600 m using a sophisticated version of the rescue capsule (Figure 1). Both these actions succeeded in extricating miners from their desperate situation. Fig. 1. Rescue missions with the Dahlbusch Bomb. Bild 1. Beispiele für den Einsatz der Dahlbusch-Rettungsbombe. The Lengede incident showed that the mining industry was not only in need of a high-quality safety concept for day-to-day operations and efficient rescue systems for emergency cases, but that it also required the right interactive mix of technology and preventive and protective safety measures. 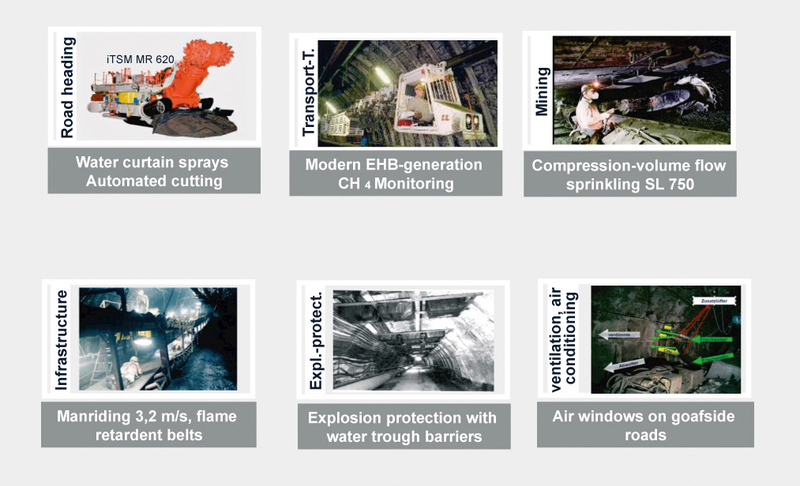 The systematic application of preventive fire and explosion protection measures in German collieries is a key factor in ensuring that, in the event of an emergency arising, those working below ground have access to planned escape routes that will lead them to safety. The ability of the mine rescue team to reach people in the event of an explosion is crucially dependent on measures of this kind. The most important and valuable asset of a mining company is its workforce. The employees have to be conscious of this if the safety measures that are an inextricable part of this mindset, and all the health, safety and environmental protection practices that have to be followed, are to be driven forward with real impact. In short: working safely and successfully is all about having the right conditions in place (Figure 2). Fig. 2. Basic parameters for a safe workplace. Bild 2. Rahmenbedingungen für sicheres Arbeiten. Proper planning, for the first stroke of the pen can determine the success or otherwise of a mining project. The use of high-quality technical and safety equipment designed to create the right conditions for a cost-efficient production process. This naturally includes the personal protective equipment. Appropriate organisation of processes and procedures and the inclusion of the workforce in the decision making. And finally, the deployment of qualified and motivated personnel. Since the 1970s RAG has sought to master all these difficult conditions by developing at an unprecedented rate a whole range of mining and safety equipment along with all manner of operational procedures and practices. This included not just the innovative development and part-automation of technical equipment such as shield supports, coal winning machines, roadheading machines and locomotives but also, i. e. the extended application of flame-retardant belt conveyor installations for manriding at speeds of up to 3.2 m/s. It is also worth mentioning the systematic and industry-wide introduction of highly effective water-trough barriers and the implementation of additional ventilation and explosion-protection measures, including the use of the ‘window technique’ on goafside roads (Figure 3). Fig. 3. Selected mining and safety developments. Bild 3. Beispiele für berg- und sicherheitstechnische Weiterentwicklungen. The industry also benefitted from the development of uniform planning and procedural standards. This was to result in industry-wide compliance with safety requirements, such as the comprehensive deployment of measurement and monitoring instruments and water spray systems in every colliery. This involved not only the introduction of increasingly powerful equipment and machinery but also the application of technology capable of defusing potential hazard situations. These efforts have paid off with all kinds of processes being developed and refined right up to the present day. Moreover, the effective interaction and synthesis of Lean Management methods and an intensification of HSE actions (health, safety and environmental management) have delivered real and sustainable success in the field of occupational health and safety. (1). During the period from the start of the ongoing mechanisation process in 1973 to the present day the number of accidents recorded at RAG establishments per million hours worked has fallen by more than 96 %, and if this is restricted to the period from 2006 to the present we find that the figure has been reduced by more than 64 %. Another welcome trend is that over the last three years the industry did not record a single workplace fatality (Figure 4). Fig. 4. Accident development figures at RAG. Bild 4. Entwicklung der Unfallzahlen bei der RAG. 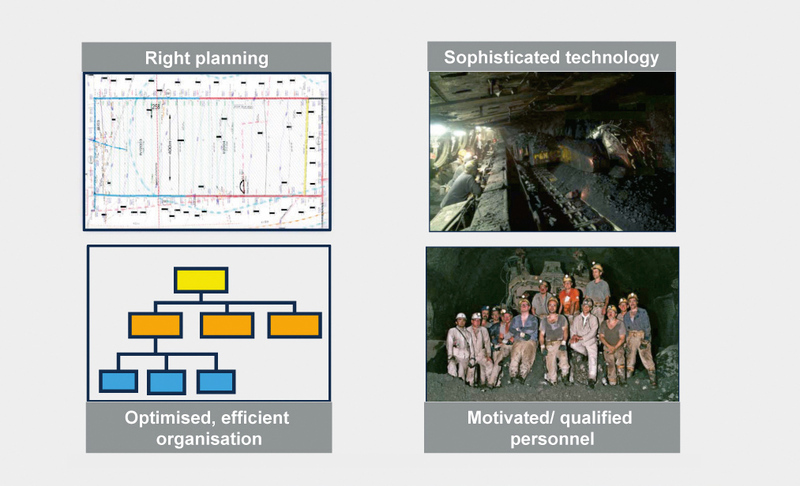 In conjunction with developments in mechanisation the coal industry was able to produce and implement various organisational and behavioural measures – subsequently combined in the technology-organisation-man (TOM model) – that were based on the company maxim that workplace safety is a prerequisite for economic production (Figure 5). Fig. 5. The RAG-developed ‘TOM model’ . Bild 5. „TOM-Modell“ der RAG. An appropriate organisational structure was also established to this effect and employees were invited to take part in the decision making processes by way of various coal-industry bodies and working groups, which enabled them to bring their knowledge and experience to the table. These organisational measures also included targeted workplace assignments designed to ensure that only workers in a proper state of health were deployed in areas presenting i. e. difficult mine-climate conditions. Another set of measures was introduced in order to guide and influence employee behaviour. In this case various training sessions, safety promotion campaigns and other initiatives were organised in order to encourage proper conduct at the workplace. Measures of the kind described above have had a positive impact on safety performance by raising worker awareness and improving overall conduct at the workplace. Employees now take it for granted that their know-how and experience has to be applied whenever health and safety issues are involved. RAG therefore now finds itself in a situation in which it has a large pool of high-quality and performance-focused equipment with all manner of safety systems in place. What is more, the company can point to very low accident rates and a workforce that remains fully motivated and knows exactly what to do when it comes to working safety below ground. From this one might conclude that everything is rosy and that RAG can sit back and relax. But this is precisely what the company will not be doing, for RAG will continue to work towards driving down accident figures to the ‘zero’ mark. Anything else would run counter to its guiding principles and aspirations. The company has launched the ‘Staying safe until 2018’ campaign in a renewed effort to avoid the kind of accidents that, in spite of the high level of safety awareness, can still be caused by inattentiveness and an underestimation of the risk involved (Figure 6). Fig. 6. The RAG ‘Staying safe until 2018’ campaign. Bild 6. Konzept „Sicher bis 2018“ der RAG Aktiengesellschaft. This initiative is also aimed at eliminating the preventable incidents that come under the heading of ‘near misses’, meaning those that do not appear in the accident statistics but rather tend to occur more by chance. RAG has therefore agreed with the collieries and technical establishments that the existing hazard assessment system for working procedures and activities should be reviewed and adapted if necessary. There will then be a monitoring period aimed at establishing whether personnel engaged in the specified activities are acting in accordance with safety requirements. Any deviations in behaviour will be documented and will result in direct discussions with those involved, and possibly in further measures, though without any sanctions or pressure being applied. The aim here is to raise the awareness of activities presenting an underrated sense of risk and to encourage workers to perform a safety check before commencing the action in question, thereby fostering a positive behavioural change among the workforce. ‘Staying safe until 2018’ also assumes a good bond of trust between all parties involved. Much can be achieved by way of regular, in-depth discussions, repeated briefing sessions and the inclusion of the workforce in finding real solutions to the various safety issues that arise at the workplace on a day-to-day basis. 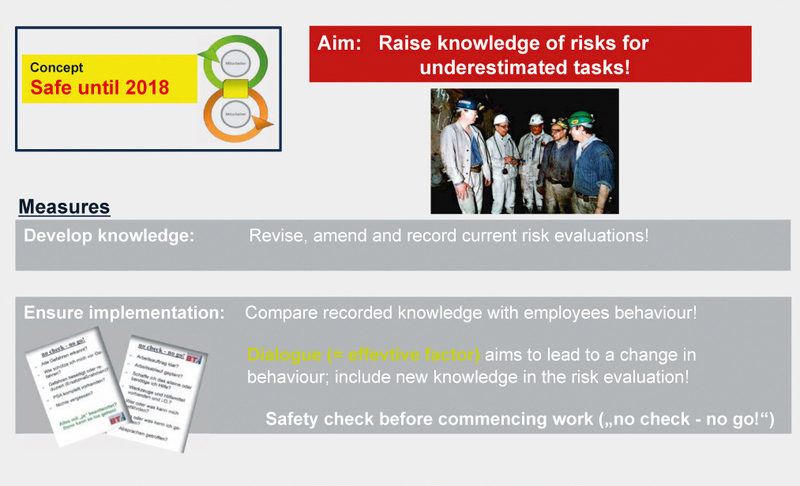 This not only raises risk awareness and instils a safety mentality but also does much for employee motivation. And well-motivated people who are taken seriously will always be safer in their work. The findings of a recent employee survey showed that motivation is still high among RAG employees, and this a mere three years before coal production finally comes to a halt. The survey found that almost 90 % of respondents are proud to work for RAG and 97 % stated that much has been done to promote workplace safety. In connection with the maintenance of industrial safety standards it also needs to be mentioned that even during the final run-down phase RAG will meet its remit in ensuring that a 325-strong mine rescue team remains on stand-by at all times. The necessary manning levels will be achieved by calling up reserve personnel – in the form of highly experienced former employees – who will have to meet certain specific requirements. An in-house recruitment campaign has successfully enlisted the services of both current and former employees, all willing to join the mine rescue brigade. As a result, the coal industry will continue to have a mine rescue and gas protection team that can be called on at any time in the event of an incident or emergency. The company motto is: workplace safety is a prerequisite for economic production. Consistency, discipline and responsible behaviour are absolute prerequisites. 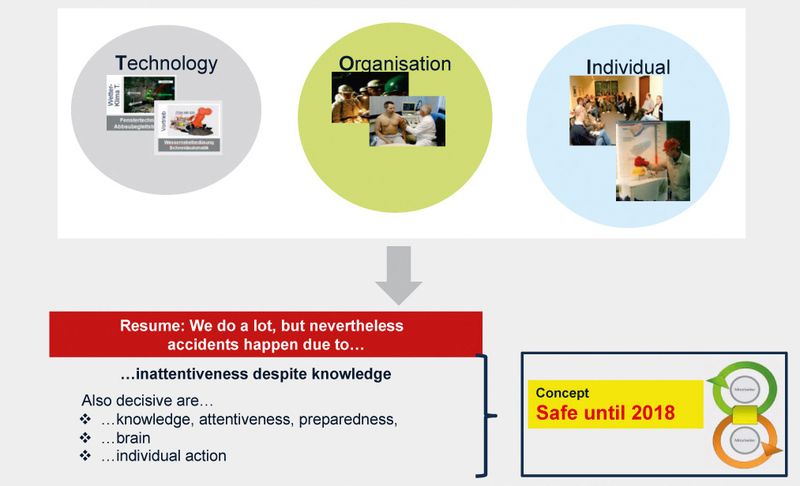 By including every area of activity and raising the safety awareness for seemingly non-dangerous situations it is possible to achieve the goal of “zero accidents”. The company will therefore continue to pursue the ‘zero accidents’ target. As part of the phasing-out process RAG intends to pass-on its expertise in key areas of industrial safety on an international level. Fig. 7. Memory of fire damp coal-dust explosion at Luisenthal colliery. Bild 7. Gedenken an die Schlagwetter- und Kohlenstaubexplosion auf dem Bergwerk Luisenthal. (1) Löchte, J., Langhanki, B.: Null Unfälle und 100 % Wertschöpfung. Utopisch – anspruchsvoll – selbstverständlich? Mining Report Glückauf (151), Heft 5/2015, S. 363 – 373.